William Symmes (Bill) Voiselle (January 29, 1919 – January 31, 2005) was a starting pitcher in Major League Baseball. From 1942 through 1950, Voiselle played for the New York Giants (1942–47), Boston Braves (1947–49) and Chicago Cubs (1950). He batted and threw right-handed. While born in Greenwood, South Carolina, Voiselle grew up in the nearby town of Ninety Six. He received special permission from the National League to wear the number 96 on his jersey as a way to honor his hometown. At the time, this was the highest number ever worn in major league baseball. Voiselle debuted with the Giants in 1942 and reached the big leagues full-time in 1944. Nicknamed "Big Bill", in his rookie season, he led the NL in innings pitched and strikeouts, and finished third with a career-high 21 wins. He made his only All-Star appearance that season and finished fifth in MVP voting. To top it off, The Sporting News named him the National League Pitcher of the Year in the first season of the award. Voiselle suffered a minor sophomore jinx in 1945, winning 14 but with a high 4.49 ERA. After many prominent major leaguers returned from World War II, his role with the Giants was reduced. He also was on the end of a $500 fine from Giants manager Mel Ott for allowing St. Louis Cardinals batter Johnny Hopp to get a hit on an 0-2 count during a June 1 game at Sportsman's Park. Voiselle was eventually traded to the Boston Braves for another wartime star, Mort Cooper, in the 1947 midseason. 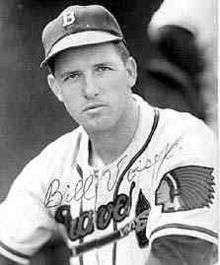 In 1948, Voiselle won 13 games for the Braves Champions Team as the third starter behind Warren Spahn and Johnny Sain. In the World Series against the Cleveland Indians, Voiselle came into Game 3 as a relief pitcher and he got the start in Game 6, taking the loss, 4–3. Most concede that Voiselle and the Braves out-pitched and out-hit the Indians, but the team was eliminated 4–2. Voiselle pitched 10.2 innings in the Series and surrendered three earned runs for a 2.53 ERA. After that, he pitched one more season with the Braves, winning just seven games, before being traded before the 1950 season to the Chicago Cubs for infielder Gene Mauch. Voiselle only spent a half a season with the Cubs, during which he failed to record a victory in 19 appearances (seven starts). It would end up being his last year in the majors, though he continued pitching for a significant number of minor league clubs. In a nine-season career, Voiselle posted a 74–84 record with 645 strikeouts and a 3.83 ERA in 1373.1 innings. Voiselle died in Greenwood, South Carolina, just two days after his 86th birthday. Voiselle is the last rookie pitcher ever to have pitched more than 300 innings in his initial major league season. Following the 1940 season, the Chicago Chapter of the Baseball Writers' Association of America established an award recognizing the major leagues' top rookie, selecting Lou Boudreau for the honor. The CCBBWAA presented the award to Voiselle following the 1944 season. Voiselle's #96 was the highest number ever worn until relief pitcher Mitch Williams wore No. 99 in the 1980s. ↑ Lollis, Dean. "When Things Weren't Fine With Bill Voiselle: Johnny Hopp, Mel Ott and That $500 Pitch". BaseballLibrary.com. Retrieved 13 December 2012.